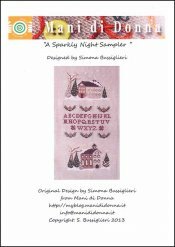 A Sparkly Nigh Sampler [G1691] - $13.00 : Yarn Tree, Your wholesale source for cross stitch supplies. Cross Stitch pattern from Mani di Donna. "A sparkly night," on this Christmas night. This design features a warm home decorated for Christmas with snow on the ground. The alphabet is stitched in the middle of the design. A church all ready for Christmas service is stitched below. Stitch count is 89w x 182h.